The global aerospace industry is growing and evolving at an unprecedented rate, constantly innovating and pushing the boundaries of technology, engineering, and human achievement to new heights. As demand for air travel continues to expand, new opportunities await our industry – opportunities we must be ready to capitalize on. But with opportunity comes risk – the risk that other countries are also competing for these opportunities, and without a strong, coordinated effort from government and industry, we could be left behind. In this high-stakes industry, success has never been guaranteed. But despite the challenges, Canadian aerospace has a history of punching above our weight and succeeding at the highest levels. A key ingredient to our success has been collaboration. Getting ahead in a globally-integrated, highly complex industry with stakeholders and decision-makers crossing multiple sectors, regions and jurisdictions is only possible when industry, government, colleges and universities work together. And up to this point, the collaborative system has worked well. Canadian aerospace, the fifth largest aerospace industry in the world, has been a leading player on the world stage. For example, Canadian aerospace manufacturing ranked among the highest in the world in terms of its contribution to total manufacturing GDP (gross domestic product). About 75 per cent of the Canadian output is exported and we form key parts of the supply chain of many companies that operate around the world. Exports grew 54 per cent between 2010 and 2015, with exports to Asian markets increasing more than 100 per cent. Finally, Canada ranks first globally in civil flight simulation and second worldwide in business aircraft production. The industry is important to Canada’s economy, too. The sector contributed nearly $25 billion to Canada’s economy and almost 190,000 jobs in 2017 alone. It leads Canada’s manufacturing sector in innovation-related investment, spending more than $1.8 billion on R&D annually – nearly a quarter of all manufacturing R&D. And like every industry that has even been successful in Canada, effective and supportive government policy makes a difference. Whether it be Canada’s automotive sector, natural resources, or our financial industry – success has been dependent on sensible public policy that takes into account industry realities and the global marketplace. Unfortunately, just as the opportunity has never been greater, today Canadian aerospace is at risk of missing out and losing the advantage we’ve worked so hard to build. As the voice of Canada’s aerospace industry, we’ve heard an overwhelming amount of concern from our members. They want to ensure that Canada remains a place that attracts and retains investment in this sector. But to make that happen, a new vision for Canada’s aerospace sector is required that all of us – industry, government, and stakeholders – are unified behind and committed to. In response to these concerns, in early October we launched Vision 2025: Beyond our Imagination. It’s an industry-led outreach plan designed to start a new dialogue about the way forward for Canada’s aerospace sector to ensure it can continue to compete globally. With Vision 2025, we’re focusing not just on the Canadian aerospace environment, but on Canada’s place in the world. In this globally integrated sector, that’s where the aerospace competition is – and the competition is only getting tighter. Countries with established aerospace sectors are creating policies and long-term strategies to maintain and grow their advantage. Emerging markets are aggressively pursuing entry into the sector and are increasing their production capacity. This global focus sets the aerospace industry apart from many of Canada’s other manufacturing sectors – which is why it’s so important that programs and policies that support aerospace in Canada reflect the realities of innovating and competing in the global aerospace marketplace. As a global aerospace leader, Canada has the opportunity to leverage its competitive advantages to grow and innovate, but we risk losing our position and falling behind if we are complacent. For an example of the stakes at play, look no further than our space sector. Canada has a 50-year history as a spacefaring nation that has made us a trusted international partner and earned us a reputation as a nation of innovators. However, over the past decade, there’s been a reduction in government investment in the national space program. There is no long-term vision in place to give guidance and clarity to companies and institutions attempting to make long-range plans for their Canadian operations. This lack of funding and investment certainty have created a climate where Canada is no longer living up to its full potential. In contrast, other governments around the world are increasing their investments in space. For example, the United Kingdom recently reinvigorated its domestic space program after many years of relative neglect. The result has been remarkable. The U.K. is now home to one of the world’s fastest growing space sectors, with investment flowing into their country from around the world, including from Canada. If urgent action is not taken, Canada’s leadership in space will continue to decline and eventually there will be a total loss in Canada’s ability to design, build and operate spacecraft. Additionally, core aspects of Canadian space capability including robotics, optics, radar, satellite communications, space science and technology development are also at risk. But it’s not just about the space program. In recent years, policies and programs designed to support industrial growth in Canada – especially those relating to R&D and technology development, the cornerstone of our nation’s aerospace leadership – have moved towards general, one-size-fits-all approaches. Rather than creating programs that identify the specific needs and realities of key economic drivers and ensure that those industries have the tools and environment to grow, programs are focused on broad-based initiatives that do not leverage our competitive strengths. All around the world, our competitors are investing in their aerospace sectors in very strategic ways in response to their specific needs. We need to be doing the same. 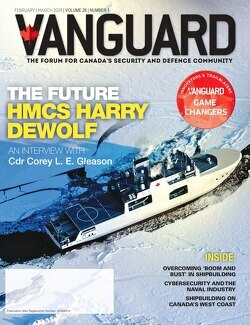 There’s an opportunity to set a new vision for Canada’s defence sector, too. Defence spending represents a huge opportunity for the government to leverage its purchasing power to strategically invest in and drive growth in Canadian industrial competitiveness. To get the greatest return on their investment of taxpayer dollars, procurement decisions should take into account the government’s industrial strategy as a whole and seek out ways to support and reinforce those objectives. We’ve seen encouraging signs of this in the government’s defence policy, Strong, Secure, Engaged. Now the challenge is to ensure that we continue to work together to make those aspirations a reality. This is why we launched Vision 2025. With a world of opportunity sitting on our doorstep, it’s time for a new dialogue and a new vision for the future of aerospace in Canada – one that leverages our economic leadership, world-class workforce, and transformative technologies to create opportunity and change for all Canadians. In the coming days and months, our industry will be reaching out to political leaders, government officials, universities, colleges and the public across Canada to discuss where we are as an industry, as a country, where we could go, and how we can work together to ensure that Canada continues to lead the way when it comes to the next generation of aerospace achievement. Through collaboration, we can ensure Canadian aerospace remains a world-leading, job-creating industry. And we can ensure Canada remains a place that attracts and retains investment in this sector, which is so essential to innovation and the future of our overall economy. We can’t wait to get started. Jim Quick, President and CEO, Aerospace Industries Association of Canada.